DVI-D Video Resolution 1920 x 1200 at 24-bit color depth. Uses a single, solid core CAT5 (or better) cable for desktop extension, simplifying installation. Solid-core CAT6 is recommended for best performance. A computer can be located remotely from a desktop area, freeing up space and providing security. Servers, computers, software, and any other sensitive hardware can be kept in a secure location where maintenance can be performed easily. Supports USB 2.0 devices, as well as USB audio devices. Place a computer up to 330 feet (100 m) from the workstation area, connected with a single inexpensive CATx cable. Supports Full HD video and USB 2.0, including control of the keyboard, mouse, Web cameras, Flash drive, speakers, microphone, and other USB 1.1 and USB 2.0 devices. The ServSwitch™ DVI-D with USB 2.0 KVM Extender preserves the quality of the DVI video signal and offers real-time transmission without the delays and compression that degrades the high-resolution viewing experience. The KVM Extender DVI-D USB 2.0 CATx comes with a standard 1 Year Double Diamond™ Warranty (Standard) already included. 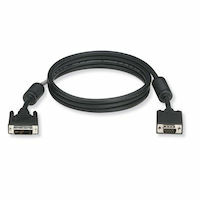 DVI-A to VGA HD15 Cable - Male/Male, 6-ft.